Located at the northern end of Coral Beach is Lin Je Kong Temple. Built on an outcrop of boulders and sandwiched between the forest and Teluk Nipah waterfront, it is accessible from the beach at low tide or a small road from Jalan Teluk Nipah. This unusual temple honours the Goddess Kuna Yin (Goddess of Mercy) as well as perhaps Walt Disney, with a collection of colourful statues dotting the surrounding landscape. 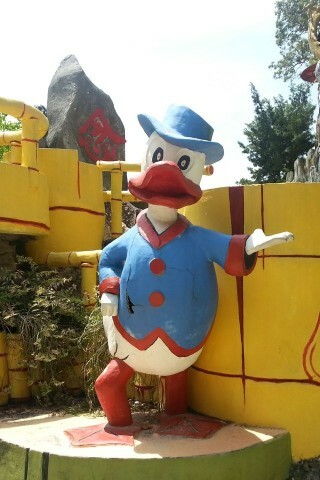 The entryway includes a large cement duck and rat (wearing circus attire) welcoming all with a friendly wave. An outdoor staircase leads to a more traditional shrine, while the lower walkways skirt the waterfront. Although a massive, fierce-looking mermaid guards the seafront, a few benches allow for any passerby to sit and take it all in.